How to find multibagger stock for investment? Which are potential multibagger stocks for 2018? There are two ways to get answers to these questions first is to carry out independent analysis and second is follow biggest stock gurus like Rakesh Jhunjhunwala, Dolly Khanna, Vijay Kedia, Porinju Veliyath, Ashish Kacholia and Anil Kumar Goel. In a first way, you need to identify and invest in stock by yourself by doing your own research. The chances are good that your stock will give you very good return. However, on the other hand, it may be possible that you may end up losing money due to wrong selection. The second way is a failsafe way where you are investing in stock backed by research of stock gurus. If we look at the history it is evident that these stock gurus have an incredible ability to identify multi-bagger stocks for investment. They have generated exorbitant wealth from the stock market. Almost every stock identified by stock gurus have given magnificent returns in the past. It is a good idea to follow these investors and invest in stock where they are investing. If you are ready to invest in the stock recommended by stock gurus, here are 35 Multibagger stocks Stock Gurus such as Rakesh Jhunjhunwala, Vijay Kedia, and Porinju. The first stock Emkay Global Financial. Emkay Global is a favorite stock of Dolly Khanna and Porinju Veliyath. In last one year, this stock has given 322% return to the investor. The second stock is Uttam Sugar Mills. Uttam Sugar Mill rose by 304% last year. It is a favorite stock of Anil Kumar Goel. 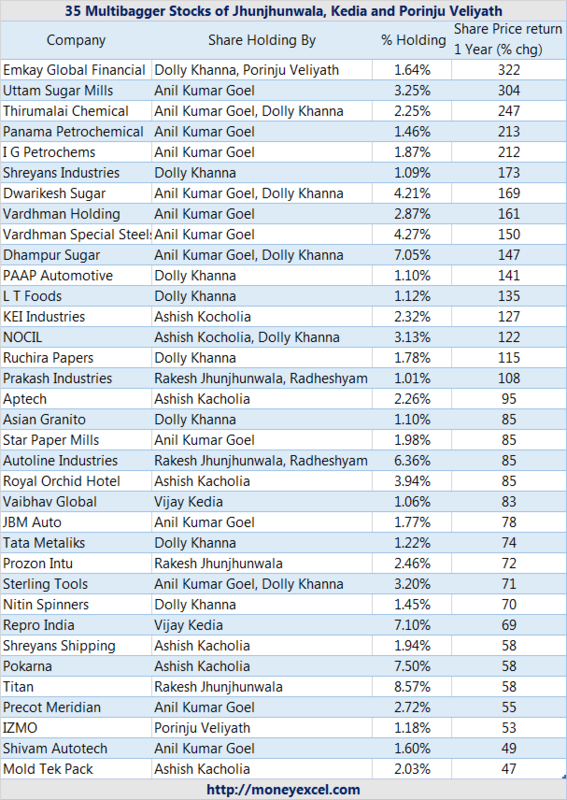 Other multibagger stocks from the portfolio of stock gurus that generated magnificent returns include Thirumalai Chemical, Panama Petrochemical, I G Petrochems, Shreyans Industries, Dwarikesh Sugar, Vardhman Holding, Vardhman Special Steels, Dhampur Sugar, PAAP Automotive, L T Foods, KEI Industries, NOCIL, Ruchira Papers etc. Also Read – Technical Analysis or Fundamental Analysis – Which is better? The entire list of 35 multibagger stocks where stock gurus are holding stake is given below. All these stocks are failsafe stocks and expected to give a sparkling return in the future. Apart from a list of 35 Multibagger stock, you can also take a look at 5 stocks that are recently recommended by Porinju Veliyath and Vijay Kedia for investment. As per Porinju Veliyath veteran Investor and popular stock market investor GVK power can be next multibagger stock. GVK Power is a huge company with great capability and excellent management. Although the company has debt as per Porinju, GVK has a huge turn around potential. GVK can surely become future multibagger stock. Kaya is a great brand with strong management. Porinju Veliyath is holding 6% stake in this stock. Kaya has good upper-class consumption story. As per Porinju, Kaya has huge potential and capability to become the multibagger stock in future. Zee Media is another multibagger stock selected by Porinju Veliyath. Zee Media is available at a low valuation. The company has recently acquired new radio business and some of the channels are doing very well. The company is expected to post good numbers in the future. Everest Industries is first multibagger stock recommended by Vijay Kedia. Everest is in the industrial, commercial and residential segment. EIL has presence in three key segments Asbestos, Panel and Pre-engineering building segment. Housing sector demand and upcoming infra growth will surely help this stock. Karnataka Bank is one of the favorite stock of Vijay Kedia. Karnataka Bank has strong and dynamic management. It is one of the most technology-savvy banks as per Vijay Kedia. Currently, the stock is available at a lower valuation. The stock has huge potential. As per Kedia, Karnataka Bank is “sitting duck” Multibagger. Do you think above multibagger stocks are good buying bet? Do share your views in the comment section. As per me, all stocks mentioned above are fail-safe stocks for investment in 2018. These stocks will surely give a very good return in the future. Raviraj is the man behind moneyexcel.com. He is graduate in finance, engaged in blogging since 6 years. Moneyexcel blog is ranked as one of the Top 10 Personal Finance Blog in India. He is not affiliated with any financial product, service provider, agent or broker. The purpose of this blog is to spread financial awareness and help people in achieving excellence for money. Please note that the views expressed on this Blog/Comments are clarifications meant for reference and guidance of the readers to explore further on the topics. These should not be construed as investment advice or legal opinion. Kedia exited from Karnataka Bank…what are ur views on ktk bank? How to update KYC EPF UAN Online? Cash Deposit Machine Locator – How to find CDM Near You? How to check Property Records and Land Records online in India?